Keeping finger foods on hand is great for boosting energy between meals. We have put together a basket that will keep them stocked through the winter. Your recipient will receive Yogurt Almonds (3 oz. 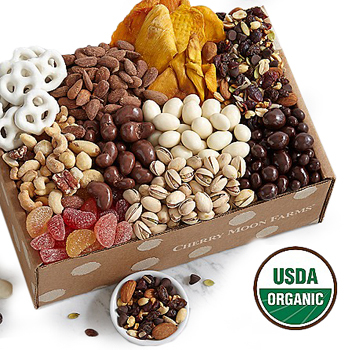 ), fancy mixed Nuts (3 oz. ), sweet Dried Mango (3 oz. ), salty Roasted Almonds (3 oz. ), Organic Pistachios (3 oz. ), tempting Dark Chocolate Pomegranate (3 oz. ), and so much more. Stock up your desk, treat the office, or send your love with Mixed Goodies.